Descartes was born in La Haye, France, in March of 1596. He was educated at a boarding Jesuit school when he was eight years old. There, he studied mathematics, music, astronomy, metaphysics, natural philosophy and ethics. Later, he earned a law degree when he was 22 from the University of Poitiers. Shortly after his graduation, Descartes had three very powerful visions or dreams that he attributed for establishing the path of his life-long studies. Next, he traveled and spent time in the army. During his travels, he met Isaac Beeckman, a Dutch philosopher and scientist. Beeckman soon became a close mentor. Descartes went back to France in 1622, and he spent a couple of years in Paris as well as other areas of Europe. During his stay in Paris, Descartes composed the Rules for the Direction of the Mind, his first composition on method. In 1623, he went to La Haye to sell his property and invested the proceeds in bonds. This gave him a comfortable and secure income for the remainder of his life. In 1628, Descartes went to live in the Dutch Republic and stayed there until 1649. In April of 1629, he enrolled in the university in Franeker. The next year he attended the Leiden University and studied mathematics under Jacob Golius, as well as astronomy under Martin Hortensius. In Amsterdam, Descartes had a daughter with a servant in 1635 while he was teaching at the university in Utrecht. 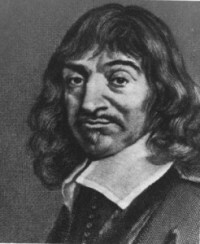 Descartes continued to publish works on philosophy and mathematics in the later years of his life. He published the Discourse on the Method in 1637. In 1641, Descartes published his metaphysics work, Meditations on First Philosophy. In 1644, the Principles of Philosophy was published and this was a combination of his Discourse and Meditations works. In 1647, the King of France awarded Descartes a pension. In February of 1650, he moved to Stockholm, Sweden, to be Queen Christina’s philosophy tutor. There, Descartes died from pneumonia when he was 53 years old. Descartes is regarded as the first philosopher to use reason to explore the natural sciences. Since he thought that all truths were linked, Descartes searched for the explanation of the natural world by using a rational approach, by means of mathematics and science. This was similar to what Sir Francis Bacon had believed. His methodology of incorporating logic and mathematics with philosophy to elucidate the physical world became metaphysical when it dealt with theology questions. This brought about his contemplation of the nature existence, as well as the mind-body duality, pinpointing the soul’s contact with the body at the pineal gland. This idea also contributed to the concept of dualism which was matter meeting non-matter. Descartes developed Cartesian (analytical) geometry, which is the use of algebra to examine geometric properties. He created an empirical comprehension of rainbows, along with proposing a naturalistic account for the solar system’s formation. This led Pope Alexander VII to add his works to the List of Prohibited Books.